UPDATE: Paper quality issues have been fixed, order with confidence now. 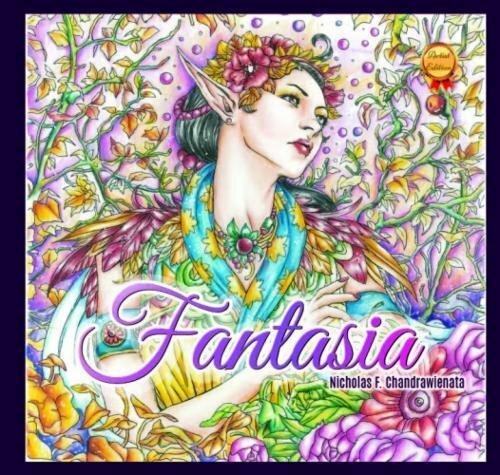 Fantasia Adult Coloring Book by Nicholas F. Chandrawienata. Wonderful and unique coloring pages will help you relax and relieve your stress and anger, variety for every skill level, printed on both sides of the page. Fantasy starts every progress and development in the human world. It is a gift from above that every person in existence possess. Since we were little, we have often fantasized about imaginary creatures. Eventually all mythical creatures that were born from the creativity of our mind, such as Unicorns, Elves, and Dragons became well known throughout the world. In Fantasia adult coloring book by Nicholas Filbert you can find various fantasy creatures like the Phoenix, Chimera, and Dwarf. I hope that this book can inspire you and help relieve you of the daily stresses of life. Let us together fantasize and colour this beauty!